In advance of my next field trip to Israel (watch this space! 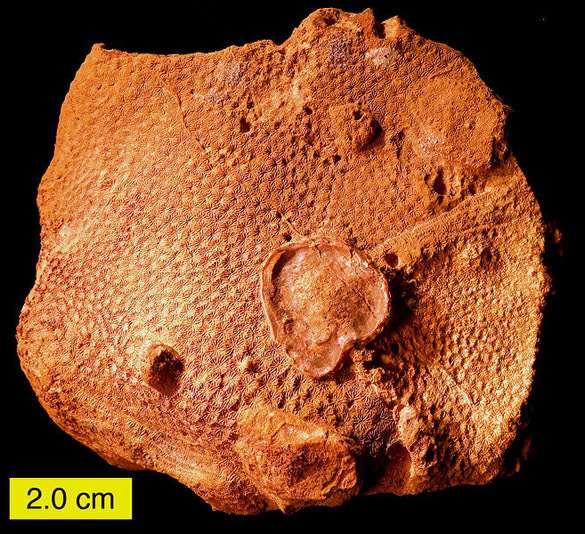 ), our highlighted fossil this week is the scleractinian coral Microsolena, a genus named by the French naturalist Jean Vincent Félix Lamouroux in 1821. The specimen above was collected from the Matmor Formation in Hamakhtesh Hagadol in the Negev Desert. It is Callovian in age, specifically the athleta Zone. (I know a lot of details about this area!) This coral is thus roughly 160-165 million years old. Scleractinian corals appeared first in the Triassic and are the primary coral in today’s oceans. Unlike their extinct Paleozoic cousins, scleractinians have skeletons made of aragonite rather than calcite. Aragonite is relatively unstable and easily dissolves over geological time. Our specimen above has been replaced with the more stable calcite. This means that the exterior is preserved well enough to identify to the genus level, but details in the interior necessary for species determination have been recrystallized beyond recognition. A nice oyster is still attached to the coral surface. Oyster shells are made of calcite and so are usually preserved very well. You can also see holes in the coral made by boring bivalves and given the name Gastrochaenolites. One of the bivalve borings is in a raised lump of the coral (center top of the image). This is reaction tissue built by the coral in response to the invading bivalve, a clear indication that some of the boring took place while the coral was alive. 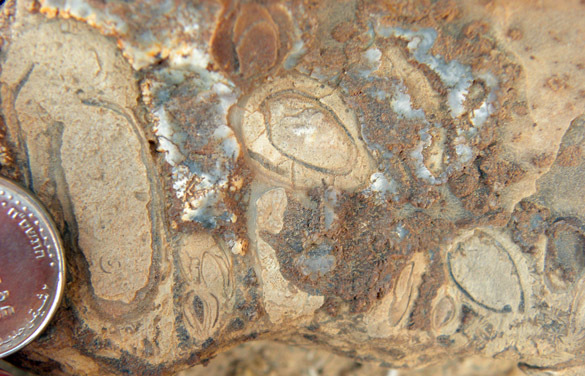 Most of the corals in the Matmor Formation are heavily bored by bivalves. Field view of cross-sections of bivalve borings (some with bivalve shells still in them) in a scleractinian coral in the Matmor Formation. 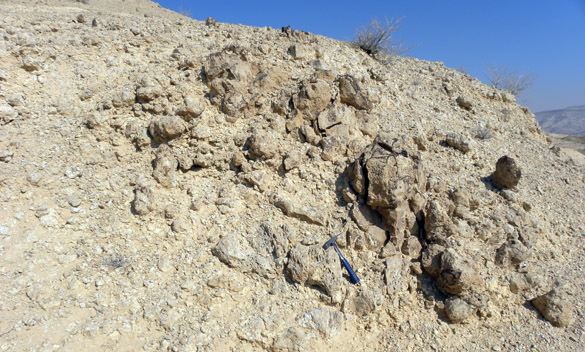 The Matmor Formation is exposed only in the cavity of Hamakhtesh Hagadol. Here it is about 100 meters thick and consists mostly fossiliferous marls and sponge-coral patch reefs. (One of the previous Fossils of the Week is a thecideide brachiopod attached to corals like the one above.) The Matmor sediments were deposited on a shallow marine ramp near the Middle Jurassic equator. It is this equatorial deposition that makes the Matmor such an interesting subject for paleoecological analysis. Most other described Jurassic faunas are in Europe and North America, and they were all formed under more temperate conditions. Fossil patch reef exposed in the Matmor Formation. Wilson, M.A., Feldman, H.R., Bowen, J.C., and Avni, Y. 2008. A new equatorial, very shallow marine sclerozoan fauna from the Middle Jurassic (late Callovian) of southern Israel. Palaeogeography, Palaeoclimatology, Palaeoecology 263: 24-29.